Hi, Today I am sharing with you How to Setup Custom Robots Header Tags in Blogger. This tool basically comes in Crawlers and Indexing in blogger. So name tells the whole story, this tool basically helps web crawlers to crawl and indexing certain part of your blog. You must learn about tags when should you them. All: There are no restrictions for indexing or serving. Noindex: Do not show this page in search results and do not show a 'Cached'. Nofollow: Do not follow the link on this page. None: Equivalent to index, nofollow. Noarchive: Do not show a 'Cached' link in search results. Nosnippet: Do not show a snippet in the search results for this page. Noodp: Do not use metadata from the Open Directory Project ( DMOZ ) for titles. Noimageindex: Do not index images on this page. Step 1 :- Login to blogger. Step 2 :- Go to search preferences. Step 3 :- Click on Edit, in crawler and indexing >> custom robots header tags. Step 4 :- Now, you will see many checkbox buttons and many options. 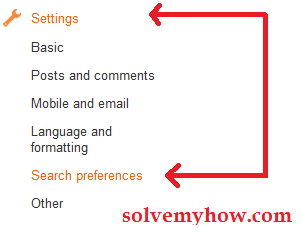 You'll see the option like Homepage, Archive and Search pages, Default for Post and Pages. Don't panic simply tick on the options as shown in snap shot below. If you have any questions regarding Custom Robots Header Tags, feel free to ask me via comment.